Scoop out the entire inside of potato into a bowl, leaving skins intact. Mix together in same bowl as potatoes, the milk, butter, salt, pepper, cheese, bacon bits, and a few green onions (the consistency can range anywhere from being somewhat chunkier to exactly as smooth as mashed potatoes. Top with more cheese and onions. 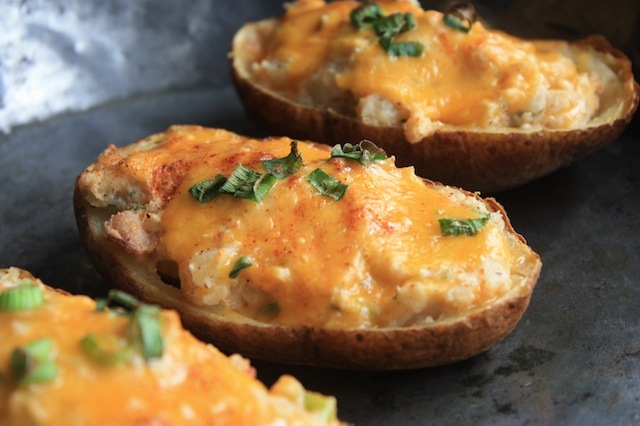 Spoon mixture back into potato skins and bake in a preheated 375°F oven until cheese is melted. For added color, sprinkle chopped parsley and paprika on top as a garnish before serving. This is an easy to do recipe and goes well with almost any kind of meat.